The Howard County Junior College District was created by a county‑wide vote on November 17, 1945, with 87% of the voters in favor. It was the first county-wide district created in the state of Texas. Seven representative citizens of Howard County (Robert T. Piner, Dr. P. W. Malone, Mrs. J. E. Brigham, L. H. Thomas, A. J. Stallings, Leroy Echols and Otis Grafa) were elected on that same ballot to serve as a Board of Trustees with Robert Piner as president. The Board was given the authority to levy a tax in Howard County at a rate not to exceed $0.20 cents on the $100 dollar valuation of all taxable property in Howard County for maintenance and bonds. On that same ballot the Board was also authorized to issue bonds in the amount of $200,000 for the construction and/or equipment of school buildings and/or the acquisition of sites in Howard County. In March 1946 E. C. Dodd was appointed the first president of the college named Howard County Junior College. From the creation of the college district to the first day of the session on September 30, 1946, there were approximately ten months to assemble a faculty and staff to lead the new institution. The fall semester enrollment was 148 students. The college was first housed in the hospital unit of the former Big Spring Army Air Force Bombardier School, two and one‑half miles west of the center of downtown Big Spring. Twenty-nine temporary army buildings located on land leased from the city of Big Spring for ten years were obtained from the government at a cost of $6,955.75. On July 26, 1947, voters raised the tax cap for the college district to $0.50 cents on the $100 dollar valuation. The college was admitted to full membership in the Association of Texas Colleges which gave full validity to the transfer of credits to other colleges in the state. In 1948 Horace Garrett would be selected for the board position vacated by Mrs. Brigham’s resignation and Charles Adams would fill the position of A. J. Stallings who elected not to run for reelection. In January of 1949 a parcel of one hundred acres of land was purchased on the southeast side of Big Spring. In November of that same year the voters floated an additional bond issue of $350,000 to supplement the original issue. In 1950 contracts were awarded for the construction of the administration/classroom building (now Old Main), an auditorium, a gymnasium and a science wing (now the East Annex of Old Main) at a cost of $550,000. On September 12, 1951, the college moved to its current location in Big Spring which included the new construction plus some temporary structures for a student union building and shops. Of specific note on August 30, the trustees adopted a resolution admitting “all qualified applicants regardless of race, creed, or color.” The following year Dr. W.A. Hunt was appointed the second president of Howard County Junior College and the municipal airport was reactivated as Webb Air Force Base. On April 30, 1955 the taxpayers of Howard County once again authorized the issuance of bonds in the amount of $600,000 for the purpose of construction and equipment of buildings and any additional sites and raised the tax cap to $0.60 cents. That same year Howard County Junior College was granted membership to the Southern Association of Colleges and Schools. In 1956 the south wing of the administration building for science (now the South Annex of Old Main), music building, practical arts building and greenhouse were constructed and the gymnasium was enlarged due to the popularity of the growing Jayhawks athletic program. In addition Howard County Junior College and the Big Spring Independent School District entered into a Memorandum of Understanding for the construction of a football/track stadium with a seating capacity of ten thousand and a privately-owned television studio and tower would be constructed on the campus as well. A new student union building made possible by a grant from the Dora Roberts Foundation was constructed in 1958 but the old structure originally from the military base would remain and be used for the language department and nurse training, art and then finally as a child care center until 2004 when it was demolished to make way for new construction. Dormitories for men and women plus some mechanical buildings would then be constructed in 1962 through revenue bonds. With the addition of the new structures, Howard College athletics would grow and the track program would achieve National Championships in 1961, 1962, 1963 and 1967. A tax bond issue of $500,000 would provide funds for the Anthony Hunt Library and a math/science building (now the P.W. Malone Center for Arts and Sciences) that would be constructed in 1967. In 1970 the applied science building was completed and named after the late Horace Garrett due to his major role in obtaining this building. A Texas Education Agency grant of $400,000 was received and matched with local funds of $369,231. In 1972 Howard College began offering classes in Lamesa, located 45 miles north of Big Spring, at the request of its citizens. A building provided by Dawson County has been used since that time. In 1973 Dr. Thomas Salter was appointed the third president of Howard College. This same year the college acquired a 137‑acre site in Martin County, near Stanton, Texas, from the federal government to be used as an agricultural research and demonstration center with an additional 138.39 acres acquired in 1978. In addition the college offered it first class in San Angelo located 87 miles south of Big Spring at Goodfellow Air Force Base. And then in 1974 Howard County Junior College was renamed Howard College and the mascot name was shortened to Hawks. Dr. Charles Hays was appointed the fourth president of the college in 1975. And then on June 19, 1975, the voters approved a bond election in the amount of $1,500,000 for a multipurpose facility for the college and community and to increase the tax cap to $0.70. In 1976 a major long-range master landscaping and beautification plan funded in part by the Dora Roberts Foundation, Dorothy Garrett, Sue Garrett Partee, Dr. P.W. Malone and the Big Spring Tourist Development Council would commence and then be updated in 1992 and 2006. In 1977 Webb Air Force Base closed which eliminated 2,825 jobs and a local payroll of $170 million. The total impact was a loss of 7,000 residents which had a significant impact on the college. The college would begin an outreach program to the region. In 1979 the 90,000 square foot coliseum would open with a seating capacity of 6,500 at a cost of $2.5 million funded through the tax bonds and private donations from Dorothy Garrett and Sue Garrett Partee. With the closure of Webb Air Force Base, local leaders strategically planned the usage of the old base which resulted in the establishment of a federal prison camp and eventually the SouthWest Collegiate Institute for the Deaf (SWCID) in the new 66,000 square foot hospital unit constructed in 1974 prior to the base closure. In the spring of 1979, steps were initiated to study the feasibility of establishing a self-contained post-secondary program uniquely designed for deaf and hard of hearing students as part of the Howard County Junior College District. Due to the efforts of the trustees, Dr. Hays and other college administrators, deaf leaders such as Dr. Doug Burke who had a vision for this type of institution and Fred Maddux, local parent of a deaf child, SWCID was first created by the college and began offering classes on August 25, 1980. On May 14, 1981 the state legislature recognized SWCID for funding purposes and placed it under the direct control and management of the board of trustees of the college district as a postsecondary educational institution providing instruction for hearing-impaired students preparing for a career or for enrollment in a senior college or university. SWCID was the only self-contained community college-type educational option for students in the country. 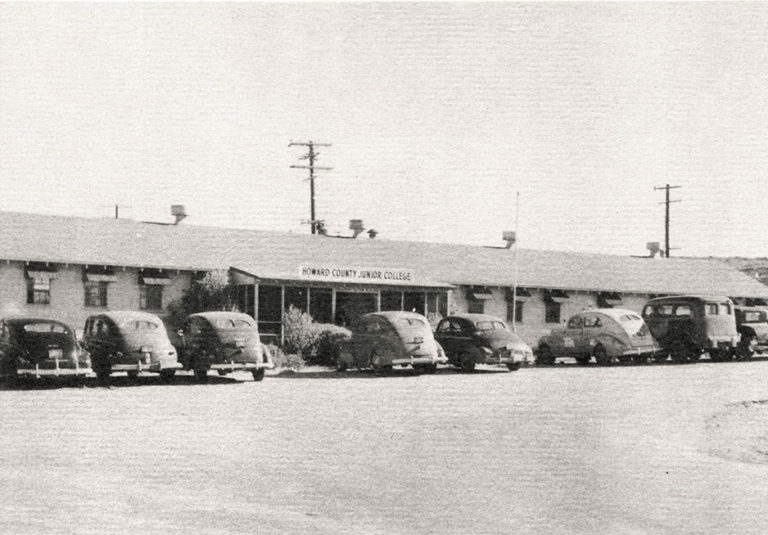 Properties deeded to the college by the federal Department of Education from the base would provide the initial administrative office/classroom (now the Douglas J. Burke Education and Administration Building), dormitory and student union building structures on a 57 acre tract of land. The rattlesnake was chosen as the mascot since it is considered to be deaf and is found in the Southwest. In July of 1980, Howard College assumed operation of a vocational nursing program from the San Angelo Independent School District located in Tom Green County. Due to interest in real estate and law enforcement as well, classes would begin in September and be offered in a leased space on Loop 306. In 1981 a vocational building would be constructed on the Big Spring site funded in part by the Dora Roberts Foundation. During the early eighties due to the revitalization of the baseball program and rodeo program, the baseball field on campus funded in part by Jack Barber and named in his honor and a rodeo arena and livestock pens on 20 acres three miles east of Big Spring were constructed. In addition vocational training classes would be initiated at the federal and private prisons located in the counties of Howard and Concho. In 1985 Dr. Bob Riley was appointed the fifth president of the college. Over the next few years a major HVAC project would be completed on the Big Spring site funded by the Dora Roberts Foundation. Due to continued enrollment growth in San Angelo, the site would relocate to new leased space on Vanderventer Drive in 1987 and then again to a space on Executive Drive in 1989. In the early 90’s, additional space would be leased near Executive Drive for the Allied Health program. In 1990 the original dorms on the Big Spring site were enlarged through revenue bonds and the women’s dorm was named after the late Ann Garrett Turner. The gymnasium was remodeled and named the Harold Davis Fitness Center. The following year the baseball team won the national championship and Dr. Cheryl T. Sparks was appointed the sixth president in 1992. Senate Bill 397 was passed by the state legislature in 1993 resulting in service areas for the community colleges in Texas. The college district service area would expand from Howard County to include the counties of Dawson, Martin, Glasscock, Sterling, Coke, Tom Green, Concho, Irion, Schleicher, Sutton, Menard and Kimble. The rural service area includes 29 independent school districts including Big Spring, Coahoma, Forsan, Sands, Dawson, Lamesa, Klondike, O’Donnell, Grady, Stanton, Sands, Glasscock, Sterling City, Robert Lee, Bronte, Water Valley, Grape Creek-Pulliam, Miles, San Angelo, Veribest, Wall, Christoval, Paint Rock, Eden, Irion, Schleicher, Sonora, Menard, and Junction. Howard College courses for which students receive both high school and college credit are offered at most of these school districts. Twenty acres of land were added to the original 100 acres of land for the Big Spring site during this time period. Funding from the state of Texas provided for the construction of a new residential complex on the SWCID campus in 1998 which would be named after former faculty member Beatrice Burke and former administrator the late Dr. Bob Mehan. That same year private funding was secured for the construction of new distance learning classrooms that would connect the Big Spring, Lamesa, San Angelo and SWCID sites and provide connectivity to school districts in the service area in a project called WINGS funded by Marie Hall. During that same time, the Virtual College of Texas (VCT), a collaboration of all Texas public two-year colleges, was created by the Texas Association of Community Colleges to facilitate sharing of distance learning courses among member colleges. Presidents of VCT member colleges developed the host-provider model upon which VCT operations rest and defined the principles of VCT’s organization and management. A three-year pilot project was launched in the fall semester of 1998. Concluding a successful pilot, VCT was established as an ongoing service beginning with the 2001 fall semester. Howard College hosts and provides a large number of VCT courses each semester. Due to this technology, Howard College was able to collaborate with the University of Texas at El Paso and of the Permian Basin to provide coursework at the bachelor and master levels in Howard College facilities. As the new century dawned in 2000, major changes would begin for the Howard County Junior College District. Howard College would be designated as an Hispanic-serving institution (HSI) and be the recipient of several federal grants to enhance its technology and services to students in the region. The addition of online courses would dramatically increase and contribute to the growing enrollment. State funding would provide for the construction of an activity center and renovation of an original dorm space for a diagnostic center on the SWCID site in 2000 and the renovation of another previous military base structure for a student union building in 2002 which would be named the Maddux Student Union Building. In 2008 the SWCID Technical Training Center would be completed. The SWCID athletic program would be initiated with the establishment of a basketball program. In 2000 the San Angelo site would expand to a new location at the West Texas Training Center which was the former Levi Straus building that had been donated to the city of San Angelo. Through the efforts of leaders in San Angelo, this 24,450 square feet building would provide much-needed space for Howard College. By 2007, a build-out would be completed to support the growing numbers of students and additional leased space of 16,000 square feet would be acquired at St. John’s Hospital to provide classrooms for the allied health programs. In July 2009, an additional 2,406 square feet was leased and 8,360 square feet was added in 2011. Due to rapid growth, master plans to accommodate future growth were under consideration in 2010. In 2002 the softball field was constructed and named Foundation Field on the Big Spring site funded largely by the Dora Roberts Foundation as the softball program flourished. In December 2002, the original auditorium and first child care center were demolished in preparation for a new fine arts facility. In 2003 Howard College would be selected to participate in the Rural Community College Initiative as one of 46 community/tribal colleges throughout the U.S. to be a part of the Ford Foundation initiative to study the impact of the community colleges in rural areas. During this same time period, Howard College brokered educational opportunity by arrangement with Lubbock Christian University for students to complete a bachelors degree while attending class at Howard College. In 2004, through the generosity of Marie Hall, the original greenhouse was renovated and an addition was added to house a new child care center named Howard Cottage. A new greenhouse was also constructed. The Hall Center for the Arts was then completed in 2006 again through the generous support of Marie Hall. In 2006, The Meadows Foundation provided the majority of funding for a state of the art playground/outdoor classroom for Howard Cottage. On May 12, 2007, Howard County citizens approved a $21,625,000 tax bond for renovation, construction and equipment of school buildings for the Big Spring site. Some of the early buildings were repurposed during this three-year project. A major renovation program of the residence halls funded by revenue bonds would be completed in the summer of 2010 as well. In addition the vocational building would be revitalized through previous and current partnerships of the Dora Roberts Foundation, Big Spring Economic Development Corporation, Texas Workforce Commission and the Boys Club of Big Spring and would be named the Don McKinney Career Technical Education Center. During this same decade, the baseball team won the national championship in 2009 with a national historic record of 63-1 In 2010 the men’s basketball team won the national championship and the rodeo program would have the NIRA All-Around Cowboy and Rookie of the Year. The current decade has continued to see much change in the college district due to historic enrollment growth peaking at 5,052 in the fall of 2011. The bond project on the Big Spring site was completed in 2011 and celebrated on September 30, which was the 65th Anniversary of the first day of class in the college district. On this day we also celebrated the naming of the Charles O. Warren Center for Community Service and the Stan and Sue Partee Residential Complex. In addition the streets of the campus were renamed after the seven original board members. Through the generosity of the G.C. Broughton, Jr. Foundation, an Ag Complex was constructed in a three-phase project consisting of an open-air pavilion, show barn and classroom building and was completed in 2013. This unique facility partners the college agriculture program and the county extension program. In addition the coliseum floor was upgraded with the completion of the Sonic Floor donated by Mike and Sheila Abusaab of Abusaab Companies, the Jirous Foundation and the Winters Family Foundation. The dental hygiene program received a grant from the F. Marie Hall Foundation for the renovation of space to house a state-of-the-art simulated dental laboratory that was completed in 2014. In 2014 demolition of the television station and tower constructed in 1956 was completed changing the skyscape of Howard College and the Big Spring area. A detention/retention pond project is underway in the same area to provide for storm water run-off diversion to local neighborhoods. Due to significant enrollment growth on the SWCID site, a temporary manufactured home park supported by the Howard College SWCID Foundation was established in 2011 and named Foundation Park. Construction is almost complete for the initial structures in SWCID Village which will provide additional student housing in cottage-type structures specially-designed for the deaf and hard-of-hearing students. This project has been funded by private donations and the Permian Basin Area Foundation. To address continued enrollment growth in San Angelo, the San Angelo site also acquired additional space in this current decade with the ISD bond project that funded the construction of a 16,512 square foot workforce training building in 2011 at the West Texas Training Center site shared by the college and the school district. In 2014, academic and student services buildings totaling 45,000 square feet were added to the WTTC San Angelo site funded through $10.5 million in revenue bonds, $2.5 million in San Angelo reserves, and $1 million from the San Angelo Area Health Foundation representing the first college-owned space in San Angelo. The Howard College San Angelo Foundation provided additional funds for equipment. Both foundations have participated in the private funding of renovation projects and equipment purchases for the San Angelo site in recent years. On November 17, 2015 Howard College celebrated the 70th anniversary of the creation of the college district. On September 30, 2016, Howard College will celebrate the 70th anniversary of the first day of class. Due to declining revenue from the state over several years and recent declining enrollment after historic growth in the beginning of this new decade, Howard College trustees set a tax rate over the rollback tax rate in August of 2015. That action resulted in a petition being circulated in Howard County which accumulated enough valid signatures to call for a rollback election. As economic conditions were becoming concerning due to falling oil prices and increasing property values, the rollback election was held on January 19, 2016. Sixty percent of the voters voted against the rollback so the tax rate was affirmed as well as the college’s role in the community. From its inception the college district has been focused on serving its students and communities. Board of Trustees Dr. John Freeman, Chairman; Maxwell Barr, Vice-Chairman; Adrian Calvio, Secretary-Treasurer; Michael Flores, Ryan Williams, Patricia Bennett and Mark Morgan will insure this continued focus with the public trust foremost in their stewardship. Decades have passed, buildings have been constructed, renovated and demolished due to the generosity of taxpayers and major donors plus instructional and technological changes have been made. However, the primary vision and mission of the Howard County Junior College District have not changed. The current motto, “Howard College…for Learning, for Earning, for Life!” captures its lifelong institutional spirit of serving the citizens of this area in the past, the present and in the future as we near the decade of 2020.